The All Progressives Congress (APC) says Nigerians may have forgiven the Peoples Democratic Party (PDP), but they have not forgotten that the former ruling party left Nigeria in ruins two years after. 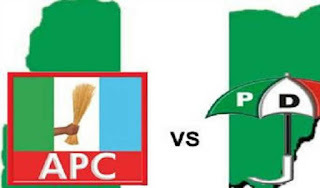 The APC National Publicity Secretary, Mallam Bolaji Abdullahi, said this on Thursday in response to the spokesman of the Senator Ahmed Makarfi-led faction of the PDP, Dayo Adeyeye, who said the victory of President Muhammadu Buhari on March 28, 2015 had left a scare in the lives of Nigerians and that it was sad that “Nigeria is worse off than the APC met her in 2015”. But Abdullahi, in a statement issued yesterday in Abuja, described the release attributed to Mr. Adeyeye whom he called the purported spokesman of a rump of the PDP as “quite regrettable”, saying Nigerians had not forgotten the PDP years of the locust.